I love words. And unfortunately, when I started out as a speaker, my presentation titles were stuffed full of them. While there is not one formula for how to create catchy presentation titles to capture the attention of companies and event organizers, using too many words is a surefire way for your pitches and speaking submissions to land in a decision maker’s trash. I’ve recently been purging old files, and in the process, unearthing my old speaker one-sheets and proposals. I’ve found some real title doozies! Share Your Story, Morning Glory: How to Use Public Speaking to Effortlessly Attract the Right Clients. Step Into Your Moxie: Listen to Your Voice, Sculpt Your Message and Speak with Confidence and Impact. Each time I run The Spotlight Speaker Accelerator and work with coaches, consultants and experts on creating catchy presentation titles for their keynotes and business and association presentations, I see many of the same mistakes I made. 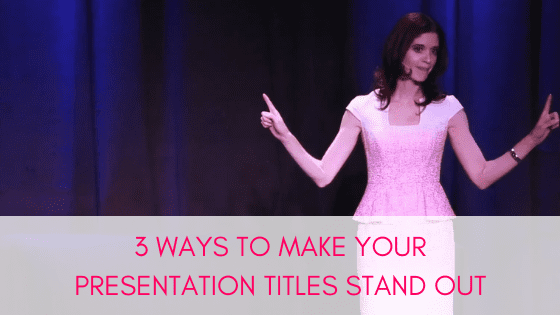 Here are three tips for creating catchy presentation titles for your speeches that event organizers, meeting planners, and business leaders will love. While it’s okay to have some pizzazz in your presentation title, you still want it to accurately reflect the key idea you want your audience to take action on and not be too open for interpretation. Let your title communicate your point of view on your topic. Decision makers get pitched oodles of similar topics, and it’s easy for speakers and their submissions to sound alike. When your title reflects your unique voice and, if appropriate, how you are taking a fresh (and maybe even disruptive) approach to a familiar topic, this will help you and your presentation to stand out. Use titles that contain 8 words or less. While, unfortunately, this isn’t always possible, in-demand speakers rarely have excessive words and colons in their titles. Rather, their titles are short, clear, and crisp. In case you are curious, here are my most frequently requested keynotes. Have a catchy presentation title that you love? That captures your core brand message? Consider registering it as a trademark in order to protect your intellectual property. Doing this with Step into Your Moxie® was one of the most important business decisions I made – well worth the nominal cost of trademark registration because it provides important protection against copycats. Similarly, before you decide, yes, this is my smokin’ hot presentation title, be sure to check online and ensure that you are first to market on your idea. It’s much easier to tweak your title before you start using it in the world and getting known for it.